When I last wrote about Zuda Comics, DC Comics’ recent venture into webcomics, I pointed out two of the new webcomics that I thought were standouts, Bayou and High Moon. Both of them are now running as features, and are prominently promoted on the Zuda Comics home page. High Moon is a horror/western by writer David Gallaher and artist Steve Ellis, with lettering by Scott O. Brown. The High Moon team has been chronicling their work on the strip in a blog, from initial proposal to acceptance and production of the currently running strip. It’s a loose, stream-of-consciousness kind of account, as blogs commonly are, but it covers many aspects of the process of creating a webcomic (or print comic, for that matter). You’ll find posts on initial concept designs and character sketches, photo reference, notes on writing and preparing the project for submission to DC Comics, plot breakdowns, page layouts, decisions about word balloon placement and, of course, preparation of the final art for the pages. There is a recent post that starts to go into more detail about that process, in which artist Steve Ellis shows how he creates the unusual look of the comic. He draws the pencils and inks in the traditional manner and scans the art into Photoshop. This is the most common method of working in the comics field today, though some comics artists, in particular some webcomics artists (like yours truly), do all of the drawing directly on the computer with a pressure sensitive tablet. Ellis often adds to his drawing once it’s in digital form and then applies an unusual step in that he tones the final ink drawing with color adjustments in Photoshop, giving the entire work a sepia, old-photograph look particularly suited to the story and its setting. He further adds to the gritty texture of the images by leaving some of his pencil marks in place, eschewing the ultra-smooth look preferred in many mainstream comics. Under the toned inks go a layer of color fields, that fill in color areas for the main forms, and on top of the ink layer goes another layer of detailed color highlights and final touches to make the finished image snap. As I pointed out in my previous article on Zuda Comics, one of the things they have done brilliantly (in sharp contrast to the history of the “big two” publishers’ less than stellar forays into webcomics) is to utilize the medium to advantage in offering the option to view the pages at high-resolution. This enables you to not only get a cinematic feeling when reading the comics, but also a more detailed look at the artwork than afforded in normal printed comics or smaller-scale web comics. When viewing the comic pages you have the option at the bottom right of the page frame to choose a full screen mode, and then read through the pages at that size. This is a wonderful feature, and particularly enjoyable with a comic as interesting and well-drawn as High Moon (see detail from the top-left panel of the final page in the image at left, bottom). BTW, for those of you who may be too young to be aware of it, the title High Moon is a perfect take on the title of the 1952 Fred Zinnemann classic with Gary Cooper and Grace Kelly (not to mention Lon Chaney Jr.). Gorilla Artfare is a new collective art blog. According to their About page, the group was formed in 2006, and now counts more than 100 members from around the world. The collaborative blog was just launched early in January of 2008 and as of this writing shows posts from about 30 artists. 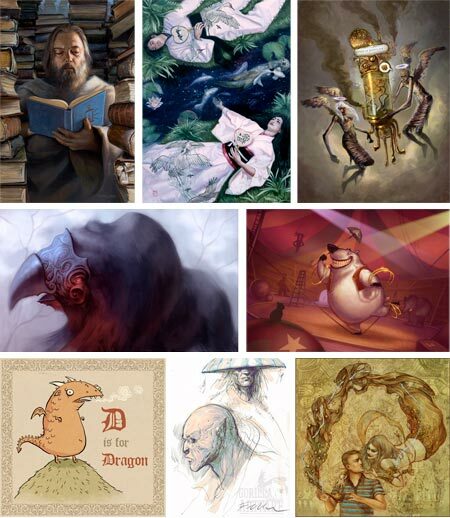 The emphasis seems to be on concept art, environments, character design and illustration. Judging from the month’s worth of initial posts, the level of ability among the artists so far represented is quite high and nicely diverse (shown above, left to right: Dave Palumbo, Tiffany Prothero, Brun Croes, Adam Paquette, Patri Balanovsky, Victoria Maderna, Simon Fellah, Alice Duke). I’ve added Gorilla Artfare to the lines and colors blogroll and look forward to checking back as more posts are added. Johnnie Scoutten is a designer and creative director who also paints and draws in a variety of media. I’m not sure if she chooses the medium to suit her subject or whether she chooses the subject for how much fun it will be to render in the medium. I suspect it’s often the latter. 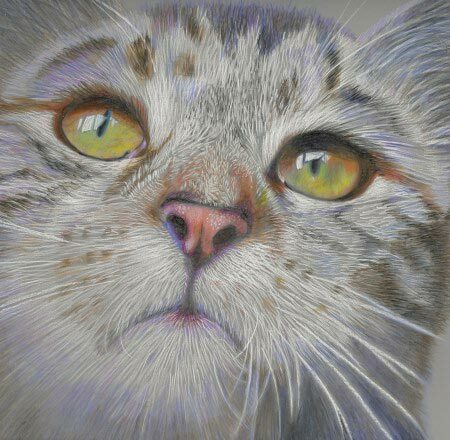 The image shown here, for example, is one of a series of similar close-ups of cat faces done in pastel and, in particular, in colored pencil on drafting film; a process she notes on her blog as particularly delightful. I was just struck by the wonderful texture of the animals’ fur and the liquidly dimensional rendering of the cat eyes in the entire series. I was also amused by the close-up compositions; notably in that they are the kind of crops most often associated with portraits of people, and tend to emphasize the anthropomorphic character of the cats. The one above, in particular, looks like it could be a portrait of the CEO from the International Mousers Guild Annual Report. Scoutten has a work in progress version of this image on her blog in which you can see the colored pencil lines going down over the gray background on the drafting film. In addition to the blog, Scoutten has a web site with galleries of her work in pastel, oil, and acrylic; with subject matter ranging from still life, to florals, to landscape to renderings of vehicles. Some are quite painterly, others smoothly blended; but there always seems to be attention to achieving a textural quality that works to best advantage in matching the subject matter with the medium and approach. Had I been on the ball, I would have told you about this earlier, as well as probably entering myself for the fun of it. 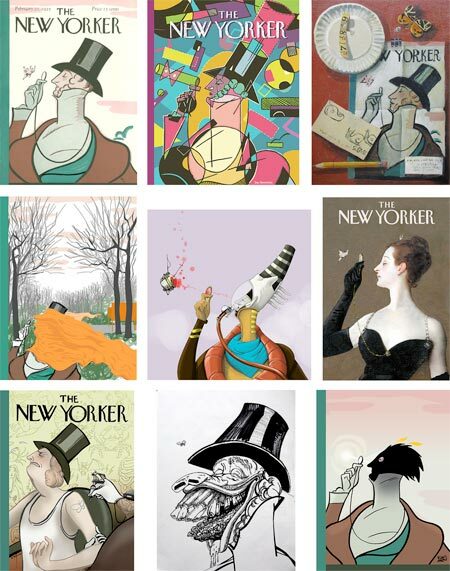 Every year The New Yorker holds a Eustace Tilley Contest, in which participants get to draw (or paint) their interpretation of the venerable magazine’s upper-crusty top-hatted and monocled iconic character. The original Eustace Tilley was drawn by cartoonist Rea Irvin for the cover of the magazine’s first issue (above, top left) in 1925, and has reprised his appearance every year since on the anniversary issue. There is a history of Eustace Tilly here. The New Yorker has a slide show of 17 past Eustace Tilleys (including Robert Crumb, Chris Ware, Charles Burns and Art Spiegelman). The contest is open to anyone. This year’s contest just ended on January 24th. (I’ll try to tell you ahead of time next year.) The winners will be announced on February 4th. Of more interest, however, is the Flickr gallery (thumbnails here) of 160 of this years entries, with all of their varied and imaginative takes on the character, his top hat, monocle, profile, stiff-necked pose and presumed disdainful butterfly fascination. I wrote about Gustav Tenngren back in June. 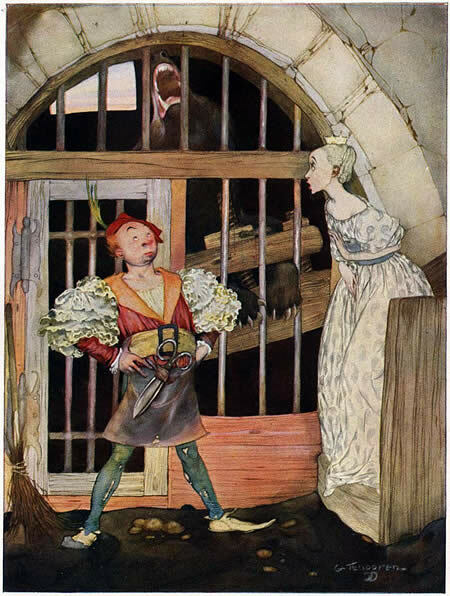 Like his countryman John Bauer, Tenggren was a wonderful and underappreciated Swedish illustrator who worked in the dark Art-Nouveau inspired style more commonly associated with Arthur Rackham, Edmund Dulac and Kay Neilsen. If your only exposure to Tenggren is his later style, as exemplified by his work on The Poky Little Puppy and similar books, you may find his earlier style quite surprising. Personally, I’m much more enthusiastic about his early style, with its dark mysteries, haunted forests, intense characters, beautiful linework and wonderfully subtle color. The new issue (#21) of Illustration magazine focuses on a feature article about Tenggren, and covers both phases of his career, though the emphasis is on the fascinating early work. Illustration has done their usual remarkable job of finding superb examples of the artist’s work, often pieces that are difficult to find elsewhere, and printing them beautifully. I’ve also written about Illustration magazine before (also here), and I now get to tell you “I told you so”, and you should have subscribed when I mentioned it because the price has gone up from the absurdly low $10 per issue to $15, still inexpensive for great classic illustrations printed this well. This issue also includes articles about the Al Parker exhibit that was recently at the Norman Rockwell Museum, and Barbara Bradley of the Cooper Studio. You can view thumbnails of the entire issue on the Illustration site, and you can still also preview thumbnails for the previous issue and its extended article on Andrew Loomis. For more information and links related to Gustav Tenggren, see my previous post. Kazu Kibuishi, who I have mentioned before, both in reference to his wonderful online comic Copper (also here), and as the primary force behind the Flight comics anthologies, has been hard at work for the last two years on a graphic novel project that has finally been released. Amulet, Book One: The Stonekeeper is the first volume of a larger, three volume project (though it reads well as a story in itself). The story is a fantasy adventure in which two siblings, an older sister and younger brother, must rescue their mother from deadly peril. It is something of a coming of age story in that they have the ability to take actions and effect events, but must take responsibility as well. In it, Kibuishi combines some themes he has favored in his work on Copper and his longer pieces in Flight — the viewpoint of children, the visual textures of elements of the natural world like rocks and water, fanciful imaginative vistas, atmospheric color and eccentric flying machines. I won’t describe it in too much detail because I enjoyed the little surprises I encountered in the story and I don’t want to deny you the same. One of the most interesting aspects of the book, though, is the way Kibuishi has chosen to create his narrative. You’ll find no panel-length word balloons with characters expounding on back-story or setup, no caption panels, no pages of exposition; everything is shown graphically, cinematically. Many sequences are presented wordlessly, or almost so, relying on the flow of sequenced images to convey the narrative. This is where a comics artist’s skills as a visual storyteller are tested, and Kibuishi shows that he has studied some of the masters, probably both in comics and in film, where many of the same problems must be resolved. In both the set up and handling of the story you can see the influence of Anime masters like Hayao Miyazaki. The drawings of the characters in Amulet are simplified, almost cartoonish; delineated with thin, single-weight outlines, and filled with areas of flat color or gentle gradations. Again, this is very like Anime, but without the slavish projection of Anime’s exaggerated stylizations to which so many young comics artists are inordinately prone. 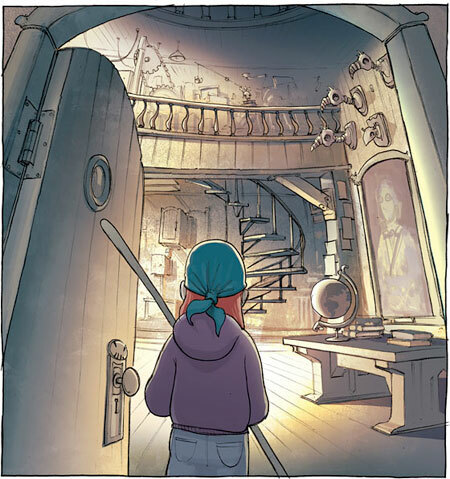 The panel backgrounds in Amulet are often more implied that realized, with muted suggestions of detail overlayed with gradients of textured color. The exceptions are the dramatic establishing panels where the details of the background are important. There, of course, Kibuishi has a chance to show off his fertile imagination, in both fantasy and “real world” settings that are rich with texture and detail. Throughout, his linework is controlled but retains a casual feeling; lines that accidentally cross another form or a panel border, and would normally be corrected, are left in place; nothing is ruled; even the panel borders are rough edged. Overall, the line, color and visual tone of the drawings are perfectly suited to the story. One of the decisions about the presentation of this story that I’m not so fond of is the size of the book. The paperback edition is about 6×9″ (15x23cm), somewhat smaller than traditional comic book/graphic novel size. The book reads fine at that size, but I just prefer the larger canvas (which is why I really like the European graphic album format which is over twice the size of this volume). The book is published by Scholastic, and this is the same format as their color editions of Jeff Smith’s Bone. In both cases it may be a compromise to keep the price of a 200 page color graphic novel down to under $10; which, for work of this caliber, is a tremendous bargain. Kibuishi has created a page devoted to Amulet, in which he collects many of the posts from his Bolt City blog that have chronicled his work on the book; although, like many comics authors and artists, he has been so close to the project that he has neglected to include introductory information for newcomers. As a better introduction, there is a 12 page excerpt from the beginning of the story (non-spoiler) on the New York magazine web site (who now has a terrific regular practice of excerpting recent graphic novels on their Comics Page). There is also an interview with Kibuishi about the project on Newsarama.